Well, that was another interesting week in the market. It seems our old friend volatility has returned. It has been nearly two years since we have seen real volatility and it sure returned in a vengeance. I saw one piece of data Friday night that this correction (10% pullback from a recent high) happened in nine trading days, which is the fastest correction on record. Yikes. I kind of preferred the recent record we set of consecutive trading days without a 5% correction. However, neither one of these is normal. Because we have been setting a few records recently I thought I would pull into the historical data just to give you a bit of perspective. Let’s look at the data from 1900 through 2016. A 5% correction typically occurs three times a year. On average, it lasts 47 days before recovering. Based on our data sample, the last occurrence was August 2015. 10% corrections (again, official Corrections) occur once a year and last on average 115 days. Our last true correction was also August 2015. 15% corrections occur every two years and last 215 days. The most recent 15% one was October 2011. Finally, a 20% correction, also known as a bear market, happens on average every 3.5 years. Its duration is nearly a year at 341 days. The last one was, you guessed it, in March 2009. A few other things to remember. First, I know NO one who is 100% in the market. Odds are your accounts have not gone down in the same amount as what is reported in the media because you are not concentrated all in equities. I know none of my clients are. Second, I believe it was Warren Buffett who said you do not have a loss until you sell. Well, selling in a down market can be a rather dangerous investment strategy. 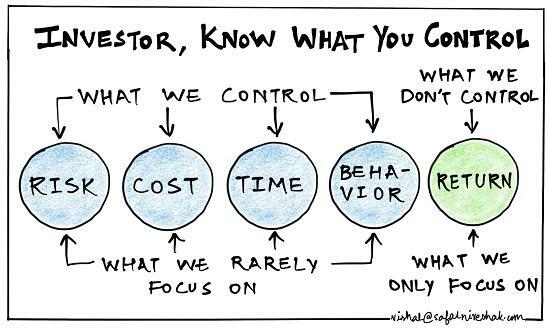 Finally, and most importantly, run away from anyone telling you they know the exact moves you should make in a down market. There are a million other factors influencing the market and most of these silver bullet recommendations are based solely on one factor. Risk – How much risk are you comfortable taking and how much risk is currently in your portfolio? In very few cases do these two match up. If you are wondering what your risk number is, click this link to take my sample Riskalyze quiz. Cost – You know this is my sweet spot. Two of the most important factors when it comes to long-term investing success comes down to cost – How much you pay your advisor and how much you pay for investments. That is why I created a flat-fee practice using low cost investments. Time – Time is on your side and even investing in the worst of markets has turned out positive over the long-term. It is normal for the market to move up and down over the short-term. History has shown us the market has always gone up over the long-term and I even illustrated this a long time ago with The Worst Timing Ever. Behavior – This one only you can solve. I can only control myself. It is times like this where it is important to revisit your financial plan, turn off things like CNBC, and talk with your advisor. I’m sure you are hearing from them. While our old friend has returned, it is a good time to get back to basics and remember this is more normal than the last two years of the market, although that was quite enjoyable. And in case you don’t believe me, here is a nice graphic to serve as your reminder.